Woodland Park Zoo Blog: It’s GiveBIG Day: Help create life-changing experiences! It’s GiveBIG Day: Help create life-changing experiences! Did you have an experience as a teen that had a lasting impact on your life? Something that changed your worldview or influenced your career? Now you can create life-changing experiences for middle school and high school students! That’s one example of what you can accomplish by making a gift to Woodland Park Zoo through GiveBIG Day on May 15! Each donation made through GiveBIG Day will be stretched based on the amount of money raised, thanks to The Seattle Foundation's stretch pool of funds. Hosted by the Seattle Foundation, GiveBIG Day is King County’s biggest day of online giving. It’s your chance to join people from all around the region to help change the world and change lives. You can make your gift today through this link. The zoo’s ZooCrew and ZooCorps programs are two programs that your gift would help support. They introduce middle school and high school students to brand new career paths, take them out of their comfort zone and teach them real-world skills, all while empowering them to become powerful conservation leaders. A great example is Tiffany Chan. 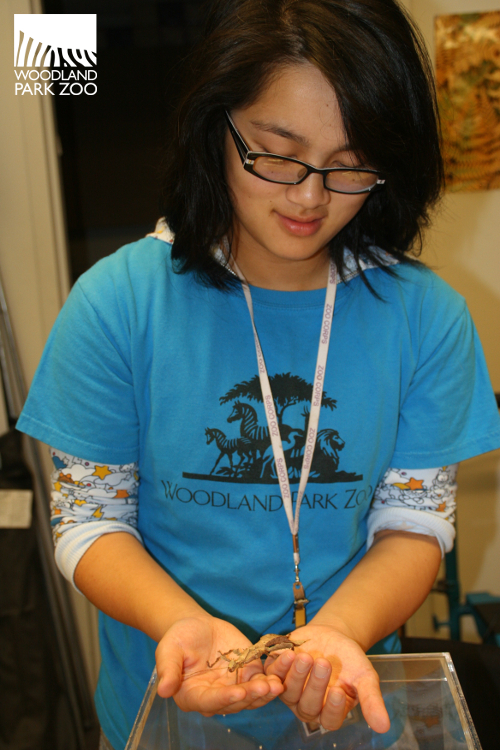 Tiffany wasn’t that interested in science when she first saw a presentation at her school about ZooCorps, the volunteer and intern program for high school students. “I didn’t even know what conservation meant!” By applying, Tiffany thought she’d get to “ride giraffes and touch tigers.” While that didn’t quite come true, she did gain invaluable experience during her four year tenure that went way beyond conservation awareness and animal care. Tiffany was exposed to a diverse group of individuals through ZooCorps. The program is made up of high school students from all over the Seattle Metropolitan area; students she never would have met otherwise. Plus, ZooCorps volunteers meet visitors from all over the world while working on grounds. Tiffany was also quite shy and quiet when she first started with ZooCorps, but through the program’s training and the many, many hours she spent engaging our guests, she learned to comfortably communicate with children and adults, both the friendly and those who were more difficult to talk to. But most importantly, ZooCorps gave her “an empowering feeling” that she could make a difference by sharing with zoo visitors what she had learned about conservation. Video: ZooCrew middle school students discuss their experiences with the program. You could change lives on a daily basis and inspire people to learn, care and act through your giving. Thank you for your support of Woodland Park Zoo and GiveBIG Day!